Publisher: Stanford University Press, U.S.A. These four conceptual and critical essays on state and society in contemporary China argue vigorously against the grain of prevailing scholarly interpretation. In substantive content, they explore two major themes from different historical and theoretical points of departure.<br /><br />First, the author argues that the party/state under Mao fell far short of the full control over China's peasant society that outside observers often assumed it had achieved. She shows, instead, how the Maoist state frequently pursued policies that in fact had the ironic effect of strengthening the resistance of rural communities against the central political apparatus. Second, she contends that once the true limitations on the Maoist state's power in rural areas are rightly understood, it becomes clear that one effect of the post-Mao economic and political reforms may be to enhance rather than to diminish the state's authority in the countryside &#x2014; despite all the reformists' rhetoric to the contrary.<br /><br />These essays on &quot;how to think about the Chinese state&quot; are designed to stimulate debate about assumptions and methods in the field of Chinese political analysis. 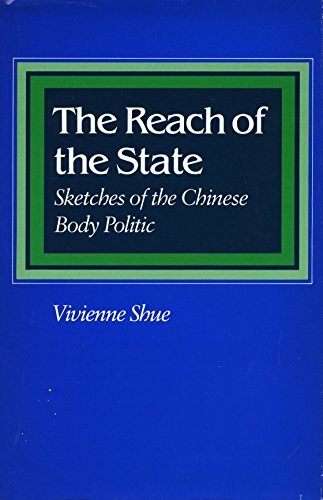 The controversies they raise, however, make them highly relevant to scholars outside Chinese studies who are interested in theories of the state, in the interrelations of state and society, and in the fate of the peasantry under socialism. Vivienne Shue is Professor and Chair of the Department of Government at Cornell University. She is the author of Peasant China in Transition; The Dynamics of Development Toward Socialism, 1949-1956.